I was tagged by Spoiled Mommy! No I dont ususally do these but she is new to this whole blogging world and so I thought I would play along! 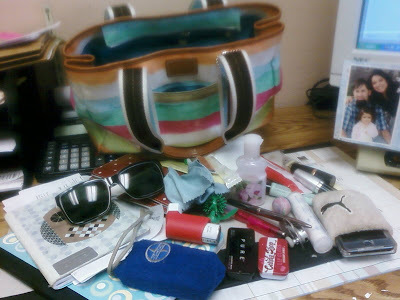 Heres the picture of all my crap out of my purse. In a blue Scion case is my Sony cyber shot camera. I always have a camera with me. small bottle of enchanted orchid bath and body works lotion. I think I bought it just to try the scent and was not a fan. my pink blue tooth. I really need to learn how to use that thing! A tube of mini tissues. The best thing from the fair. Now that The Phi is out of the baby wipes phase these are a great substitue. They look like giant pills but you just add water and you have a big and durable wet wipe. I seriously love these things! an almost empty tube of C.O. Bielow Metha Lip Tint in Tint # 1136. I love the mintyness of this stuff! A pen from The Yarn Deli. LOVE that place. My red glittery Paul Frank wallet that holds all the cards and checks, a picture of The Phi, my business cards, and cash if I ever have any. I mean who carries cash anymore! Big Composition notebook to jot down anything I may need to jot down. Hence the 3 pens in the purse! The only thing missing was the case for my sunglasses which I can only assume is in the car and my cell phone which I was using to take the picture. Dang thats a lot of stuff. What's the most important thing in your handbag? Hmmmm. I guess my wallet. It has important things like my drivers license, debit card and starbucks card. Or maybe The Phi's inhaler. My kid breathing really is a top priority for me! Whats the smallest thing in youe handbag? Bobby pins. I always have bobby pins. Is there anything illegal in your hangbag? I don't even carry apruse anymore...but when I did, I don't think I came even close to rivalling the amount of stuff in yours! Oh and I thought Enchanted Orchid was a dud too. I've actually started getting mostly Body Shop stuff over Bath and Body Works. Oooh, and Lush! If you haven't seen them, I'd bet you'd like it. www.lush.com I think is the site.